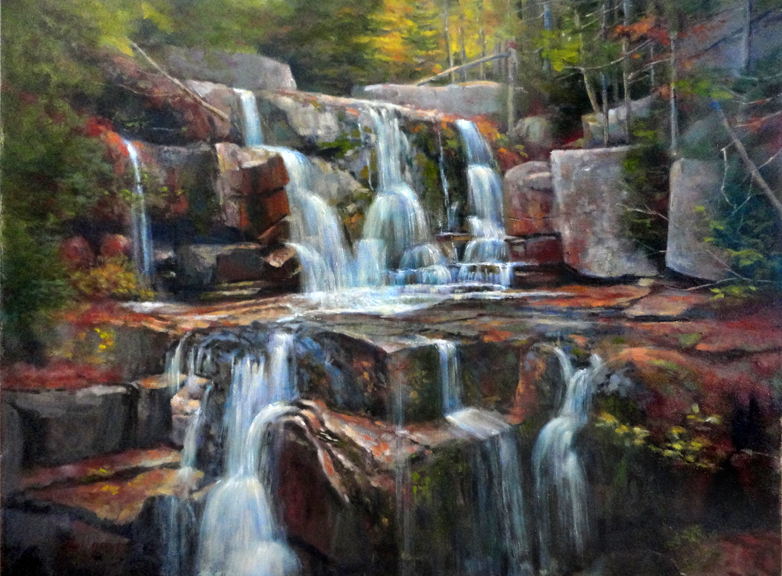 This original oil on canvas painting is a luminous summer scene of Baxter State Park Falls, located in the state of Maine. It’s painted in a realist style in brown, white, green, yellow, Indian red, blue, old, cream, and gray tones. This piece was painted during the first few months of 2015, and is part of a series of large-scale landscape pieces. The piece was built up gradually through a series of successive layers as I carefully explored the contrasting textures and areas of light and shadow. The structure of the rock formations I found particularly inspiring. Baxter State Park and Monhegan Island both possess very unique landscape formations.